Mushtaq Travel have partnered with booking.com to offer the best deals on your hotel accommodation worldwide. Call Our Reservations Team on 01332 361650 Flexible Booking Options & Reservation On Hold Facility Travel Agents Welcome. View our current accommodation deals for Pakistan below, from 5 star Luxury to budget hotels available in Islamabad, Lahore, Karachi, Peshawar, Quetta, Multan and many more, for all worldwide hotel bookings use our online booking engine. The five-star international Islamabad Marriott Hotel is located at the foot steps of the famous Margalla Hills and is within close proximity to Rawal Lake, the town centre, President & Prime Minister Houses, Ministry of Foreign Affairs, Senate, Parliament House, Foreign Missions, World Bank, Government Offices, corporate sector, Print and Electronic media offices etc. The Hotel is a favourite rendezvous of politicians, diplomats, businessmen and movers and shakers of the country. Owing to the perfect location of the hotel, it hardly takes half an hour to commute between the Hotel, the Islamabad International Airport and the places of interests. The Islamabad Serena Hotel stands at the foot of the Margalla Hills on fourteen acres of areas with beautiful gardens and serene water shore near the Rawal Lake, next to the Diplomatic Enclave. The architecture and interiors of this fabulous hotel building is a mere reflection typical of Pakistani of cultural heritage also depicting the skills and craftsmanship. Being state-of-the art building, the hotel beautifully combines traditional systems equipped with latest technologies. The true spirit of the hotel is reflected in the aesthetics of the public areas, corridors, rooms and restaurants with special emphasis on trademarks of Islamic architecture. 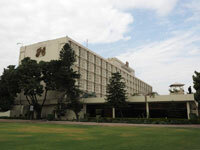 Welcome to the Sheraton Karachi Hotel, the only internationally managed five-star hotel in Pakistan. Located just 17 kilometers from Jinnah International Airport, we are at the center of the business district of Karachi. Guests can enjoy instant access to local shopping and sightseeing, explore the nearby beaches or see Karachi's well-known Kemari Harbor. The Sheraton Karachi Hotel is proud to be the first five-star hotel to have an exclusive Airport Welcome Lounge at the International Arrival Terminal of Karachi Airport. 407 guest rooms have been tastefully furnished and offer three room categories; Business, Deluxe and Club. Imagine an experience created to meet your every desire, where you are much more than a name on register - where service is not just a word - it is a way of being. The style surrounds you and makes you feel sophisticated. You can actually feel the vibes of glamour, movie stars and intellectuals that give Lahore a vibrant history. Pearl Continental Hotel Lahore possesses a legacy that makes you realize that there is no place like this - yet your experience is essentially and uniquely yours. The prices are per night per room net rates. Flexible bookings with the option to place reservations on hold.